I don’t know for sure that Palo Alto, CA, the home of the venture capital industry and next door to Stanford U., is really the highest IQ town in America. The highest test score public schools in America are in Lexington, MA, a suburb preferred by Boston area college professors. And I imagine tiny, rich municipalities like Atherton, CA might have higher average IQ residents than sprawling Palo Alto with its pretty middle class housing stock. But still … the average home price in Palo Alto is $2.5 million, which is kind of a lot considering the average home is a nothing special ranch style house. Palo Alto houses average $1,471 per square foot, so a 3,000 square foot house would cost $4.4 million. So if you took the average IQ of the people who live in Palo Alto and the people who work in Palo Alto, it would be awfully high. Historically, that’s not a coincidence. As I pointed out in Taki’s Magazine in 2012, Palo Alto has been as central to the story of IQ science in America as it has been to the story of electronics in America. Just before WWI, Lee de Forrest invented an important version of the vacuum tube in Palo Alto, while Stanford professor Lewis Terman published America’s first major IQ test, the Stanford-Binet Intelligence Scales in 1916. In 1921, Terman began his landmark study of gifted children with IQs of 135 and above, which continues even today to track its dwindling band of aged subjects. (Ironically, the young William Shockley was nominated for inclusion in Lewis Terman’s study, but his test score fell just short of the cutoff.) To the public’s surprise, “Terman’s Termites” showed that highly intelligent children were not particularly likely to grow up to be misfits like the much publicized prodigy/bad example William James Sidis. Indeed, the higher the IQ, the better the outcome. Terman’s study was an early landmark in Nerd Liberation, one of the 20th century’s most important social developments. Lewis’s son Fred Terman, dean of engineering at Stanford, pretty much invented the distinctive aspects of the Silicon Valley educational-industrial complex, such as by encouraging his students Hewlett & Packard to go into business for themselves. But Palo Alto wants to stay at the forefront of the growing fad for damnatio memoriae, by rewriting its history to eliminate the names of its now politically inappropriate founding fathers. A majority of the school board agreed on Tuesday that two of the school district’s middle schools should be renamed in light of their namesakes’ leadership roles in the eugenics movement. Recognizing an opposing view in the community — that to rename these schools would be to sever generations of alumni’s ties to tradition and history — most board members said that in a public school district in 2017, however, schools cannot carry the names of men who actively advocated for policies grounded in a belief that people of certain races and disabilities were inferior to others. All five trustees said they support a majority recommendation from a district committee, convened last year to study and make recommendations on the renaming issue, to give David Starr Jordan Middle School a new name, and a majority said they also believe Terman Middle School should be renamed. David Starr Jordan was the first president of Stanford U. He was an anti-imperialist who wrote a famous anti-war treatise pointing out that war was dysgenic: the morally best young men would get gunned down in vast numbers, while the sleazier would be more likely to avoid such a fate. 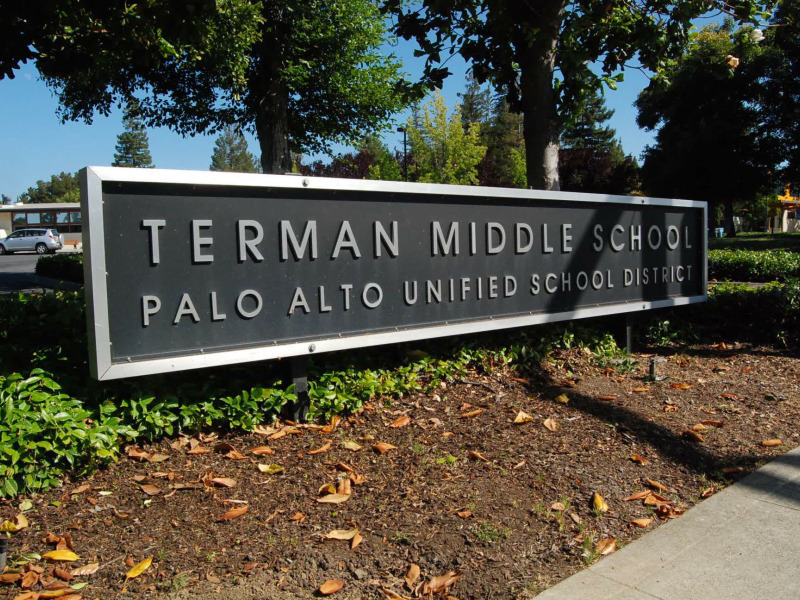 Terman’s fate is slightly more complicated given its naming history, trustees said Tuesday. Terman was first named after Lewis Terman, a prominent Stanford University psychologist, when the school opened in 1958. When the school later closed and then reopened in 2001, it was named to honor both Lewis and his son, Frederick, an accomplished Stanford electrical engineer. There is no clear evidence, committee members said Tuesday, that Frederick played an active role in or supported the eugenics movement, as Lewis did. His son inherited Lewis’s biases: Fred Terman’s wife of 47 years, who had been one of his father’s grad students, said he only became serious about courting her after he went to the Psych Department and looked up her IQ score. One committee member recommended retaining the Terman name, but making clear that it honors the son, not the father. A majority of the committee recommended against this, arguing that “retaining the surname will not effectively disconnect the school from Lewis and does not effectively disavow his eugenics legacy,” committee member and parent Sara Armstrong said Tuesday. It’s almost as if the anti-eugenicists believe that Fred Terman inherited the sins of the father via ideological Corruption of Blood. They should rename Jordan the Angelo Mozilo School, because at least Angelo didn’t believe the wrong things. Angelo put your money where his mouth was when it came to believing that Mexican were good bets to pay back their mortgages. Many parents urged the board Tuesday night to seize the opportunity to take a visible stand for the values it so often cites: equality, diversity and inclusion. After all, there’s nothing that screams equality, diversity, and inclusion than Palo Alto’s NIMBY policies that keep the average house selling for $2.5 million. By the way, Stanford is running a project to make school district average test scores comparable across the country. As I pointed out in Taki’s Magazine last spring, the worst white-black test score gap in the country was found in violently liberal Berkeley, CA. The next four least equal school districts were Chapel Hill-Carrboro, NC; Shaker Heights, OH; Asheville, NC; and Evanston, IL. Other liberal college towns with massive white-black gaps include Madison (U. of Wisconsin), Iowa City (U. of Iowa), Charlottesville (U. of Virginia), Austin (U. of Texas), Bernie Sanders’ Burlington (U. of Vermont), Durham (Duke U. ), and Ann Arbor (U. of Michigan). Palo Alto, next door to Stanford U., the sponsor of this research project, also has an intense white-black gap, but not enough blacks can afford to live in Palo Alto for it to make my sample-size cutoff for reliability. Now that’s what I call equality, diversity and inclusion! I’ve met Pinker and Murray, and they really are noticeably smarter than I am. Back in 2010 it occurred to me that I ought to write about a book explaining why it isn’t the end of the world that some people are smarter than other people. That would be my great contribution if I could explain why, just as it’s not a global crisis that all the medalists in the next Olympic men’s 100m dash will be black, the fact that some races tend to be smarter than others doesn’t mean we should dig up Hitler’s DNA and elect him President. But, you’ll notice, I haven’t written that book yet.